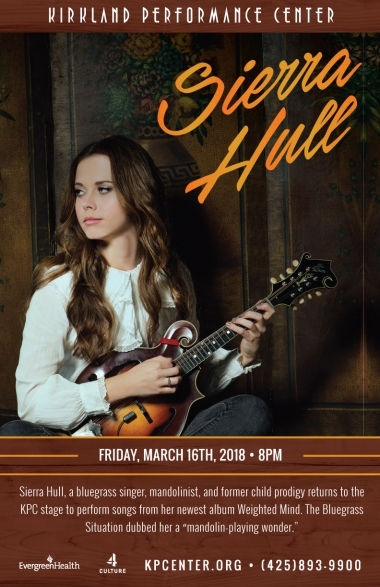 Sierra Hull, a bluegrass singer, mandolinist, and former child prodigy returns to the KPC stage to perform songs from her newest album Weighted Mind. The Bluegrass Situation dubbed her a “mandolin-playing wonder”. Phoebe Hunt will be opening. Sierra Hull, the singer, mandolinist and former child prodigy who signed with Rounder at age 13 and distinguished herself by becoming the first bluegrass musician to receive a Presidential Scholarship to the prestigious Berklee College of Music, released ‘Weighted Mind,’ her first new album in five years, on January 29, 2016. 15-time Grammy winner Béla Fleck produced the recording, which features eleven compelling new compositions written or co-written by Hull, and one traditional tune for which she and Fleck provided a new arrangement. While Hull’s ethereal voice and fluid playing take center stage here, she receives ample support from bass marvel Ethan Jodziewicz. Béla Fleck’s banjo adorns the elegant “Queen of Hearts/Royal Tea,” and Alison Krauss, Abigail Washburn, and Rhiannon Giddens add enchanting harmonies.